A 3D donut pie chart prezi presentation template with equal quarter pieces. Present your business or company data with a creative and infographic presentation. Use markers to add numbers or icons to the donut pieces on the chart. Rearrange the elements and create a unique layout for your diagram. Create a circle process or progress diagram and present your content professionally. Suitable for a corporate business or company presentation or for presenting personal data. 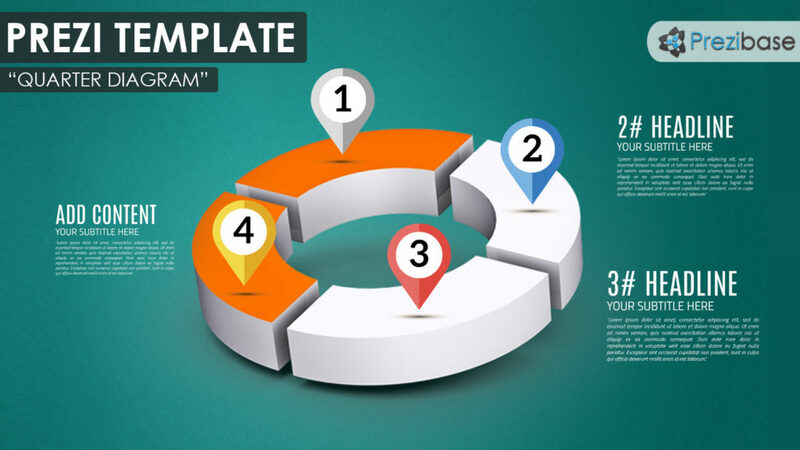 Show statistics, numbers or just use the template to present 4 equal pieces of anything on a circular chart. Note: the color scheme of the chart cannot be customized. Contact us for a custom version. This entry was posted in Best Prezi presentation templates and tagged 3d, 3d donut chart, 3d graph, 3d pie chart, business, business reports, chart, circle, circular, creative, diagram, donut, donut diagram, graph, infographics, marker, markers, pie, pie chart, presentation graph diagram, process, quarter, reports, zoom.